Worldwide there are 1,200 bat species, including the bumblebee bat, who weighs less than a penny and is the world’s smallest mammal. California alone has 24 bat species. Both keen eyesight and echolocation help bats to hunt insects. 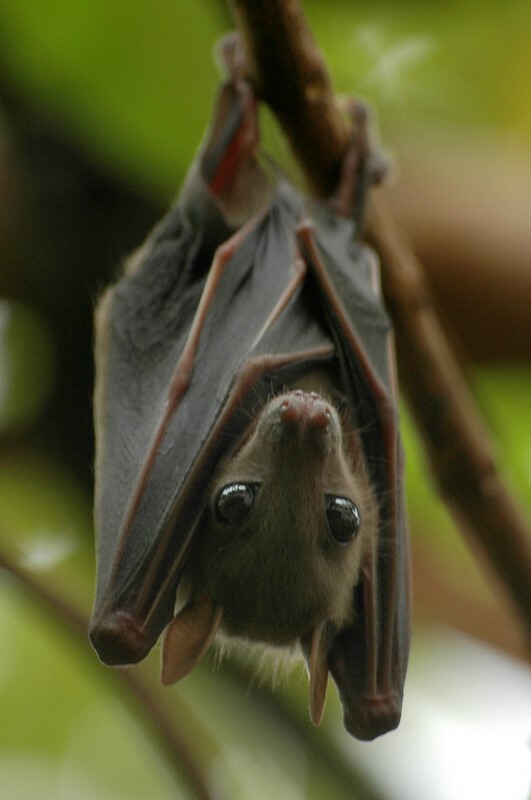 Bats are nocturnal and spend their daylight hours hanging upside down in their roosts. In the northeastern United States, these fascinating small mammals are struggling to survive a crisis that threatens their very existence. Since 2006 a fungal bat disease, White Nose Syndrome, has seriously disturbed bat hibernation patterns. Since the winter of 2007- 2008, millions of insect-eating bats in 29 states and five Canadian provinces have died from this devastating disease that has now reached the west coast of the United States. In March 2016, a little brown bat found sick in the state of Washington’s King County tested positive for White Nose Syndrome. The strain of fungus that sickened it was genetically similar to strains found in the eastern United States. Because bats have only one pup a year, the decimation of bats due to White Nose Syndrome (an 80% decline in some affected areas) is having a huge negative impact on bat populations. For good reason, this massive decline of bats has created alarm among farmers. According to the U.S. governmentʼs National Wildlife Health Center, bats consume enormous amounts of crop-harming insects, and their insect suppression services to U.S. agriculture are valued between 4 and 50 billion dollars per year. Bats also help to pollinate plants and spread seeds. White nose syndrome is not known to be harmful to humans, pets, or other animal species, according to Washington State’s Department of Fish and Wildlife. If you find a bat, contact these organizations or your local wildlife rehabilitation center before taking any action. Although only a tiny fraction (less than one-half of one percent) of bats can have rabies, the possibility is a reason to contact bat experts early. Handle bats only under the guidance of bat experts such as BCCC, BCI, or with the help of a bat rehabilitator associated with your local wildlife rehabilitation center. Keep in mind that being handled by humans can be traumatic for wild creatures. “Never try to feed, treat, or wash an injured bat,” advises the BCCC. Sadly, each year countless bats (and their pups) are destroyed during re-roofing and other construction work. BCCC provides specific advice for anyone contemplating re-roofing or remodeling. Those who plan to remodel a home or re-roof it will find step-by-step instruction from BCCC on how to prevent harming any roosting bats that may be in the attic. We can all help struggling bat populations by having a properly constructed, properly installed bat house on our property. BCCC and BCI provide information on constructing or purchasing a bat house and installing it properly. It will increase the likelihood of attracting bats and provide a safe roost for them. Keep away and keep dogs away from areas where bats roost or hibernate. Both humans and dogs can act as carriers of the White Nose fungus to new sites. The best way for hikers to limit the spread of White Nose Syndrome is to avoid entering caves or areas where bats may be roosting or hibernating. Wildlife officials follow strict instructions for decontaminating their clothes and gear when they need to investigate rock cliffs, caves and mines that might contain bats. We can also help bats by sharing information on bats with our friends and neighbors and by advocating for a pesticide-free neighborhood.